Because different users will want to use Ardour for different tasks, the way time is measured in the application can be changed. Users creating audio plays, documentaries, reportages or soundscapes may wish to use Minutes and Seconds, for example, while those recording bands or producing electronic music will most likely use Bars and Beats. Video producers will find a frames-per-second Timecode handy, while those wishing for extreme precision may even want to use Samples. All of these can be viewed in Ardour and used as a means to organize your regions and edits. There are two clocks near the top of the Editor Window which can display the time in a number of formats: Timecode, Bars:Beats, Minutes:Seconds and Samples. Right-click to change the format of each of the two clocks. When No Grid is selected, Regions may be moved freely around within the Tracks. When Grid is selected, Regions will "snap" to the nearest Grid Point. When Magnetic is selected, Regions can be moved freely but will "snap" to a Grid Point when they are moved very close to one. The middle Units menu is used to select what the Grid Points will be, such as Beats, Bars, Marks, Minutes, Seconds, various aspects of the SMPTE Timecode, or the edges of Regions. The Timeline is located below the Snap Mode menus, just above the Main Canvas. By Right-Clicking on it, you can set the check boxes to display the different types of time information. To view Minutes and Seconds on the Timeline, right-click the Timeline and select Minutes:Seconds. You will be able to set the Grid to either Seconds or Minutes. To view Bars and Beats on the Timeline, right-click the Timeline and select Beats/Bars. You will be able to set the Grid to either Bars, Beats or a convenient multiple of beats, such as 3, 4, 8, 16 or 32. It is possible to set a Meter and Tempo for the entire Ardour session, as well as to change them at different points in the same session. For more information on this, please see the Setting Up the Meter chapter. 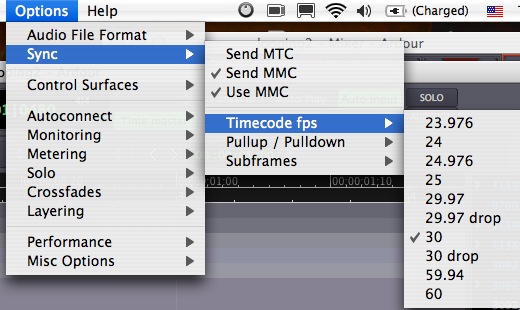 To work with SMPTE video Timecode, first you need to set the Timecode fps (Frames per Second). 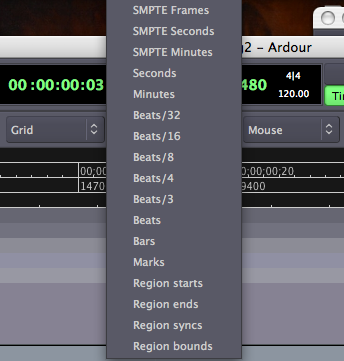 This can be found in the main Ardour menu under Options > Sync >Timecode fps. Once you have done that, make sure you make the Timecode ruler visible by right-clicking in the Timeline and checking the Timecode box. You will be able to set the Grid to SMPTE Frames, SMPTE Seconds and SMPTE Minutes. Now that you've set up the Timeline, continue on to the chapter on Creating a Track to add one or more Tracks to your Session.